(CNN) -- He was lauded and ridiculed. He broke down barriers and built them around himself. He soared to heights unimaginable with his music, and he made the ignominious front page of gutter tabloids worldwide. Michael Jackson broke down musical and cultural barriers his entire life. For Michael Jackson, the spotlight was always present, and the rest of the world followed. With "Billie Jean" and "Beat It" -- the latter with Eddie Van Halen's scorching guitar solo -- he was almost single-handedly responsible for getting videos by African-American artists on MTV and helped revitalize the moribund Top 40 format in the early 1980s. His incredible dance talent, a modern twist on the Motown moves he witnessed as a child, led to a heightened focus on choreography in pop music videos and stage shows. His 1982 album "Thriller" smashed records. It was No. 1 for 37 weeks and, at its peak, sold a million copies a week. To date, it has sold nearly 50 million copies worldwide. The achievement set a high bar for Jackson; when his 1995 greatest-hits CD, "HIStory," sold 7 million copies, it was considered a relative failure. Jackson was also a fashion icon, his heavily zippered leather jackets a de rigueur 1980s fashion accessory, his single, spangled glove beyond compare. From the time he was a child, it was obvious Michael Jackson was something special. In 1966, when he was 8, he joined his brothers in the band his father put together and started singing lead with brother Jermaine. Enter the quintet from Gary, Indiana. Motown signed the group in 1968 and poured its all into the Jackson 5's first single, "I Want You Back" -- the writing and production team were credited as "The Corporation" -- and Jackson's imploring, dramatic vocal rocked America. The song hit No. 1 in January 1970, and was followed by three more No. 1s in quick succession. Thanks to their squeaky-clean image, the Jackson 5 became teen idols, unusual for a group of African-American youngsters. 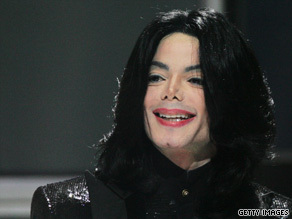 Michael Jackson's face appeared on the covers of teen magazines; the band even became the subject of an animated Saturday-morning TV show, another first for an African-American group. But it was in the 1980s, when Jackson became a worldwide phenomenon, that his impact really began to be felt. There came a moment, around that time, when pop music went into a Jackson era. "Thriller" had nine songs; seven of them became singles. Jackson teamed with Lionel Richie to write the fundraising song "We Are the World"; it was his presence, as much as that of Richie, Bruce Springsteen and Stevie Wonder, that propelled the song to No. 1. He was a role model. At the peak of his fame, there were reports of a humbly dressed Jackson ringing doorbells as part of his Jehovah's Witness faith. Though Jackson's image eventually became sullied by the molestation allegations and stories of eccentricity, there was never any doubt about his entertainment legacy. "Thriller" and "Bad" are still among the top sellers of all time. His fluid dance moves and stage presence set standards that rising stars -- often compared to Jackson -- struggle to equal. And then there's the music, from the early, explosive joy of the Jackson 5 hits to the elegant ballads, down-and-dirty grooves and ecstatic dance hits of his solo years. "The Love You Save," "Billie Jean," "Beat It," "Bad" -- they are pop music boiled down to its best essence, with a good beat, an engrossing melody and even, sometimes, a message of love and fellowship. It's enough to take a listener to the moon.